I debated long and hard about what class and car to build for a run at SCCA autocross and I settled on the 986 Boxster S as a dark horse for CS. (GRM thread) A search was put forth and I have finally purchased the victim, er "candidate" was located. It's a 2000 Porsche Boxster S, Finland build, with 2 options: cruise control and the wind deflector. The PO added the correct stand-alone 18" wheels and it's otherwise a stone stock 138K mile example with complete service records including IMS, new clutch, and a 33K mile used transaxle all done at Porsche dealers. I paid less than the PCCB brake option for the 718 Boxster for the whole car. I'm going document everything about this build here and on YouTube. It's going to be a dedicated autocross car for C Street in SCCA and may dabble in P03 for PCA as well since there's good overlap. I will be attending the SCCA National Tour and ProSolo in Packwood this season and the end goal is my first trip to Nationals in Lincoln in 2020. Last edited by Luccia at Pelican Parts; 02-18-2019 at 12:15 PM. I love this stuff! If you don't know Woody (itsnotanova) yet, follow his six months to live posting. Great stuff there too. Good luck and keep posting! Welcome to the forum. I've been following on GRM and glad to see you here now too. There's some great guys here who can answer ANY of your 986 specific questions and a whole lot more. Awesome man! I just bought a 2000 986 base in September for autox and hpde. I will be following your threads and progress! Congratulations and we look forward to following your progress! Thank you everyone. It's not my first Porsche autocross rodeo, I campaigned a 944 in PCA Improved for 2 seasons, but I am definitely looking forward to running this car. Welcome aboard. I have a friend that races SCCA autocross down here in Texas and the key to winning is losing weight. There's only so much you can squeeze out of a M96 but there's a million ways to take some pounds off. Here's a video of him on a practice run. Last edited by Luccia at Pelican Parts; 02-18-2019 at 12:14 PM. Now that it's home I'll pull all of the extra junk out of the car (and weigh it), clean it up and check for phantom weight (dirt and rocks hiding! ), and replace the fluids. On the tire front, thinking of a 235/285 staggered setup on the Bridgestone RE71R's. The goal is the first Bridge City Autosports event of the season, 2/24/19 at Portland International Raceway. Come run with us! Time for the next episode of Project Porsche Boxster autocrosser. This time it's time to put the Porsche on a diet. I pulled the box of spares out of the trunk for 18 pounds and the spare tire out of the nose for 30 pounds, bringing our fighting weight down to 2905 pounds. I still have the floor mats inside, the radar detector, and the phantom weight to get out of it plus taking the gas down more and the changing the muffler we're looking pretty good. The wind deflector is another 2 pounds as well! Last edited by Luccia at Pelican Parts; 02-18-2019 at 12:09 PM. Javelin, do you plan to change out your brake hoses? If so, are you going to go with OEM or OEM equivalent? When I bought my car and got a PPI, I was told that the brake lines look like they are still original, which means at this point they are about 19 years old. I want to change them out, and the cost of SS is not much more then buying an OEM equivalent like ATE and OEM is more expensive then a set of SS lines. I've tried searching around but there isn't many threads on this topic. I thought yours might be the best to ask this question since you are trying to stay in stock class and I know SS lines will bump you up. 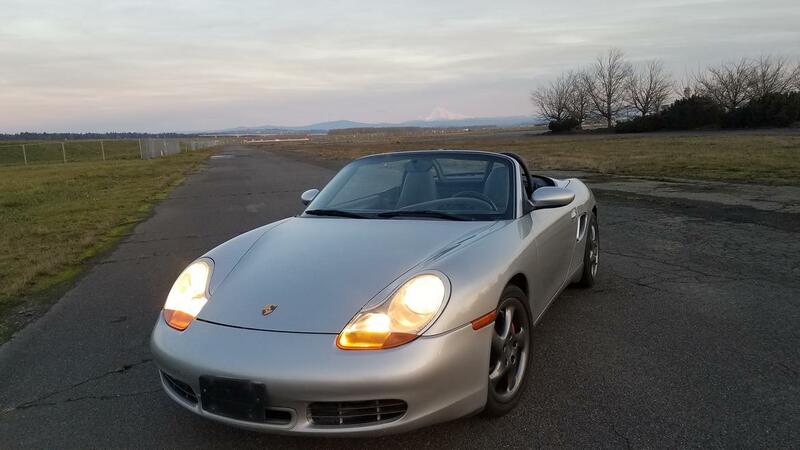 Cool to see a Boxster being used for competition, especially in the PNW! I'm in Seattle, and track my 2002 2.7, but haven't done any autocrosses with it yet. Just wanted to be sure, the 1/16" toe figure is toe-out, correct? Looking forward to following your progress, Javelin. I am not planning on replacing the brake hoses at this time, but if I do have to I will have to use the OEM style rubber/PTFE versions. I have used SS lines on other projects, including track day cars, and never needed them nor got any actual measurable performance advantage from them. That said, can't hurt either. Awesome! Maybe I'll see you at an event this season. Yes, the toe is toe OUT. you've obviously got a lot of experience, but 235/285 seems to be a huge difference in stagger. why not closer to a square setup and dial the handling with suspension tweaks? are you limited by class rules? In SCCA C Street rules you have to run the stock wheel width, and I have the staggered 18x7.5/18x9 optional wheels. With the lack of spring force and front camber I will be lacking in the mechanical grip and tunability needed to run a square setup and really will need to just maximize tire contact patch at the detriment to everything else. Really good autocross setups are terrible on a road course and visa versa. I did some testing last season in my CAM class Cobra with staggered wheels (17x9/17x10.5) and found that it performed better with a staggered 245/275 setup than with a square 275 setup (or a staggered 275/305 setup for that matter). Sidewall deflection started to make itself known. That's why I'm leaning towards the 235/265 over the 265/285 for now. Are you running commensurately larger / diameter tires? Or are you adjusting profile to maintain diameter? I'd be interested in how that impacts autox. I'd think the smaller diameter might aid in accelerating from point to point in those lower gears. On the other hand, sidewall flex is probably a big deal too?